Monroe County taxpayers will save more than $2 million in payments on the Oak Hill elder care facility over the next decade, it was learned Tuesday morning. A refinancing plan will replace bonds issued in 2004 and 2005 following a voter referendum to build the county-run nursing home, saving county taxpayers $2,010,482.09 over the 10-year issue period. Bidding for the new bonds was the focus of a tense session in Monroe County Treasurer Kevin Koenigstein’s office Tuesday morning, as a computer screen counted down minutes and seconds to the bid’s closing at 10 a.m. Bids were received online. A hush fell over the office when Piper Jaffray consultant Michelle Bock clicked on the screen as bidding closed. It was revealed that the winning bid for an average rate was 2.395126 percent by Robert W. Baird & Co., Inc. Three more bids trailed by only .13 percent from second to fourth. Koenigstein and Monroe County Commissioner Terry Liefer stood by in anticipation, waiting to see the results. “This was a big day for Monroe County,” Koenigstein said. Outstanding bonds for Oak Hill total about $13 million at this time — $3 million will be retired from a reserve fund that was required to be maintained to cover the issue under previous conditions, and $10 million in new bonds are being issued. Piper Jaffray’s Michelle Bock said good circumstances came into play. “Last week, the sale might have gone .1 percent higher. But a large part of the reduced rate – down from an average of 4.7 percent on the old issue – is due to the county’s good financial condition, including the recent increase in the Standard and Poor’s credit rating from AA- to AA,” she said. 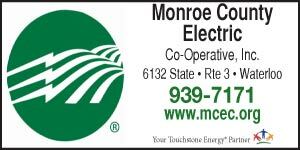 The Monroe County Board confirmed bid approval and closed the sale on Tuesday afternoon. During the regular county board meeting Monday morning, Monroe County Highway Engineer Aaron Metzger reported on readiness for the coming winter, saying the county has good stocks of salt from previous mild winters and is currently trucking cinders from the Baldwin power plant for this year. Dry-run training for road crews has also been going forward. Metzger also indicated the motor fuel tax program will provide some $500,000 for seal coating roads this year, split out at $243,000 for materials and $257,000 for labor and equipment rental. Koenigstein reported that three percent of property tax bills – about $1.5 million – remained outstanding as of Monday. Reminder letters will be mailed this week, and those with unpaid tax bills after that will have their names published in the Republic-Times on Dec. 4. Sale of properties still subject to overdue taxes will follow on Dec. 17. The board also approved the following appointments: Scott Rippelmeyer as a commissioner to the Columbia Drainage and Levee District #3; Carla Heise as County Ambulance Service Coordinator; Dwight Boehm as Monroe County Animal Control Administrator; Sheila Wetzler as County General Assistance Supervisor; Mike Fausz as County Mapping and Platting and 9-1-1 Coordinator and as County Zoning Inspection Officer; and Scott Soma, Dan Kelley, Josh Bayer and Jim Doyle to the County 9-1-1 Emergency Telephone System Board.